Vooruitlopende op de Sonus faber Aida Show in September bij Rhapsody, hierbij alvast een luister ervaring op papier. 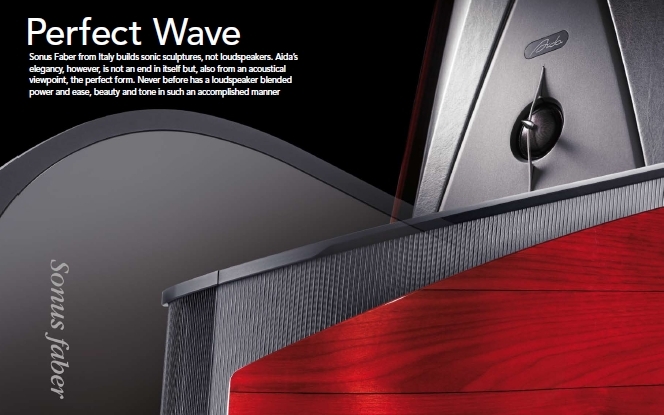 Perfect Wave — “Sonus Faber from Italy builds sonic sculptures, not loudspeakers. Aida’s elegancy, however, is not an end in itself but, also from an acoustical viewpoint, the perfect form. Never before has a loudspeaker blended power and ease, beauty and tone in such an accomplished manner”. Click here for the full experience. Dit bericht werd geplaatst in Luidsprekers - Enceintes, Reviews - Tests, Sonus faber en getagged met aida, audio, electronics, herman van den dungen, hifi, music, sonus faber, speaker. Maak dit favoriet permalink.